Hardwood floors in a blonde wood. 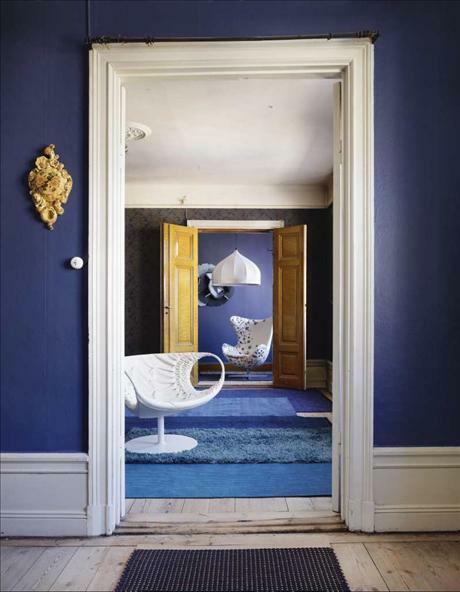 Shades of blue layered across the walls and floors, from dark navy blue to lighter shades all in various textures creating a rich palette you want to run your fingers across. Dashes of yellow ocher on the doors and ornamentation with a healthy dose of white in the ceiling, door frames and furniture to help balance out the blue. Home decorator Per Wennberg was inspired by the latest designs and furniture fairs in London and Milan. Interior design with a high fashion styling! New furniture contrasted against brightly colored vintage rugs. 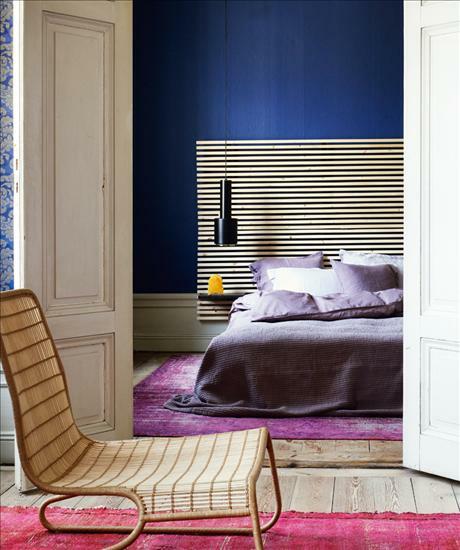 Dark blue, pink, purple and blonde wood, a unique and stunning color palette. Apothecary style cabinets are definitely in trend. 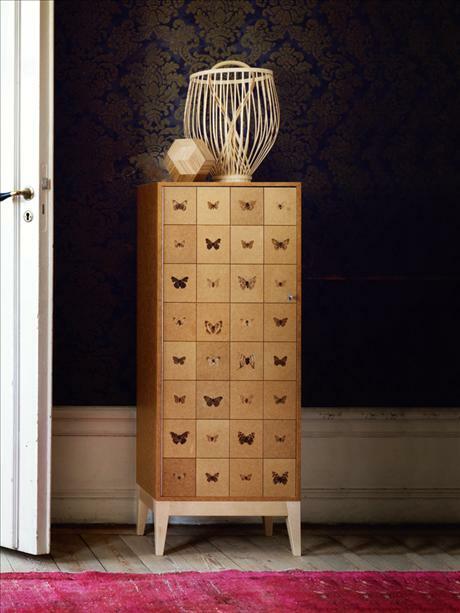 Personify them and add a touch of nature with organic type motifs such as butterlies. 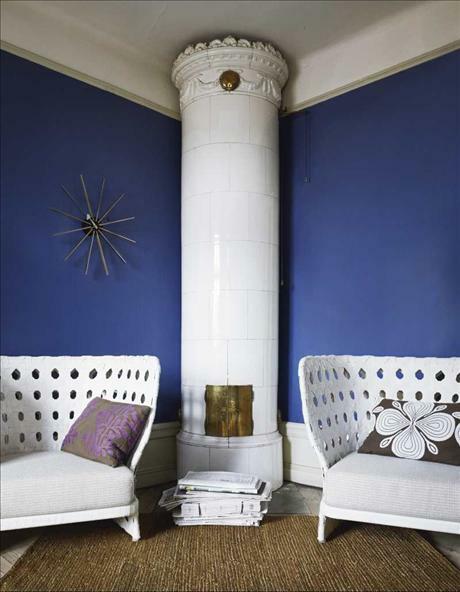 Blue walls that teeter on violet: Hue NCS S 6020-R 80B. Cool industrial style loft with cement floors, original metal plate ceilings, industrial lamps, recylced materials and modern urban art. Welcome to the Zombie Kids loft, the home of DJ Jay Cumhur. You really cannot get a living room that screams cool and male and DJ so loudly like this one does. From the studded black leather lounges, the bright green geometric rug, to the music crates repurposed as coffee tables, the large skull and cool magazines. I particularly fancy the Adidas shopping bags turned cushions. No shelving needed, books arranged neatly on one side of the wall. Tons of industrial fixtures as far as the eye can see and modern abstract art adorn the walls. Thought provoking and cool at the same time. I’m just taken aback by such a big slab of the color red, it’s mesmerizing. Funky retro toys, vintage robots have been making a huge comeback. Skulls again, this time wall mounted with some modern graphic art pieces and framed concert tickets. Super cool, narrow stairs take you down to the Aladdin’s cave of records. Rustic exposed brick walls and metal framing adding to the cool factor. If you make music, then this is paradise. Highly stylized bathroom in a modern, male cool vibe. Now that is a collection of sneakers! one for every color of the rainbow and to suit every mood. A gorgeous modern apartment in Earthy, serene neutral tones Tribeca, New York. A London loft decorated with recycled items that have been re-purposed to create a quirky, cool, off beat space. The use of vintage floral fabrics gives the place a nice organic feel.